Scott Flatley is Director of Construction for Allen Morris Residential. 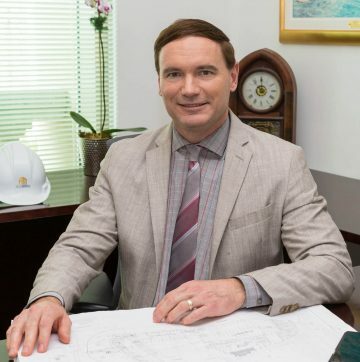 In his role, Scott oversees the execution of the firm’s extensive development pipeline, working with the company’s Development Managers to improve building design and also with general contractors to refine pricing and carry out construction. Before joining The Allen Morris Company, Scott served as Senior Development Manager at The Related Companies, a real estate development firm that specializes in urban living neighborhoods for all income levels and high-end mixed-use centers for emerging cities. He completed over five million square feet of developments valued in excess of $2 billion, and has proficiency in project management on all scales. Prior to working for The Related Companies, Scott served as Regional Director of Design and Construction as well as LEED AP for Rockefeller Group Development, who manages commercial real estate properties in Atlanta, Miami, and New York. Scott graduated with honors from the University of Florida with a bachelor’s degree in construction science and civil engineering. He finished his master’s degree in business administration at Goizueta Business School in Emory University in Atlanta, Georgia with concentrations in real estate development and finance. Additionally, he earned his LEED designation and is a certified Green Roof Professional (GRP). Flatley is an active member of the Institute of Real Estate Management (IREM), National United States Green Building Council (USGBC), and the National Association for Office and Industrial Parks (NAOIP).